Bernardine’s late husband had kept chickens. Nine in all. His favourite one was white with three little black feathers in its tail. He called it Turtle Dove. Bernardine’s late husband’s flock of nine produced eight eggs daily. Which one wasn’t laying was anyone’s guess. He dreaded to think it might be Turtle Dove. The thing was, now that her husband had passed on, Bernardine simply did not need eight eggs a day. She decided one egg a day was enough. There are some things in life that have to be done. Bernardine took the bull by the horns. She bit the bullet. One chicken killed a day was the answer. She would chop its head off, pluck it, and throw it into the freezer. How Bernardine hated the fall of her tomahawk. The chicken’s neck was laid on the block and down came the sharp tomahawk, severing the neck. What if she missed? The first day passed. One chicken was safely in the freezer. 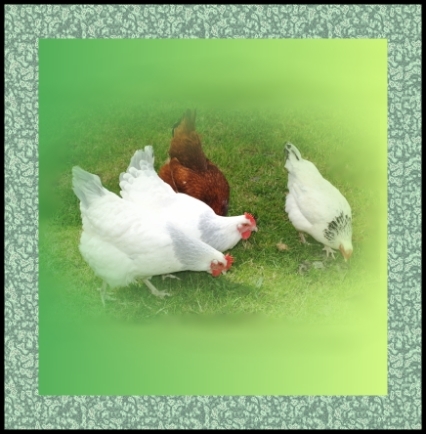 The next day, from the eight remaining hens, she gathered seven eggs. After the second day she gathered six eggs. After the third day she gathered five. Down went the number of chickens until there were two remaining hens. Bernardine was getting one egg a day. One of the remaining chickens was Turtle Dove. Bernardine chopped the head off the second to last chicken. The next day she got one egg! From Turtle Dove! What a dear chicken! Oh, but it must be lonely. So lonely. These days, Bernadine has a flock of eleven, including Turtle Dove. A chicken needs company. Bernardine gathers ten eggs a day.